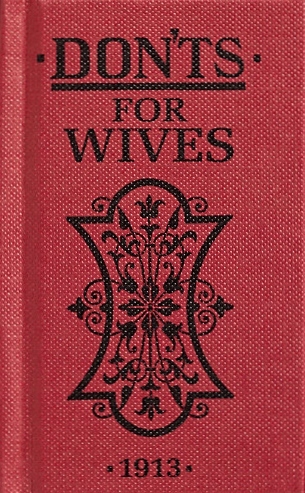 These are words of advice written by Blanche Ebbutt in 1913 as part of a set of guidebooks on marriage. They were published on the eve of the First World War when women were mostly homemakers and men were the breadwinners. The book brings to mind a time where couples wanted to put on a united front for their friends and neighbours, having servants was nothing unusual and women were seen as the lesser gender. *Don’t forget to ‘feed the brute’ well. Much depends on the state of his digestion. *Don’t be discontented and think your husband not ‘manly’ because he happens to be short and thin, and not very strong. Manliness is not a purely physical quality. *Don’t think it beneath you to put your husband’s slippers ready for him. On a cold evening, especially, it makes all the difference to his comfort if the soles are warmed through. *Don’t let him have to search the house for you. Listen for his latch-key and meet him on the threshold. *Don’t try to excite your husband’s jealousy by flirting with other men. You may succeed better than you want to. It is like playing with tigers and edged tools and volcanoes all in one. *Don’t let your husband wear a violet tie with grass-green socks. If he is happy devoid of the colour sense, he must be forcibly restrained. *Don’t refuse to see your husbands jokes. They may be pretty poor ones, but it won’t hurt you to smile at them. *Don’t ‘fuss’ your husband. Mistaken attentions often annoy a man dreadfully. If he comes home late after a busy day, and has a quiet little supper alone he doesn’t want you to jump up like a Jack-in-the-box with ‘would you like more pepper darling?’ See that everything is conveniently placed for him and then leave the man alone until he has fed. *Don’t vegetate as you grow older if you live in the country. Some women are like cows, but there is really no need to stagnate. Keep both brain and body on the move. If women today took these rules seriously, they would literally be hanging around the threshold waiting for their men to come home from work to give them compliments on the housework, serve dinner without a word said except to ask how his day went and remain seated wistfully with listening ears. What do you think of these guidebooks? Do you think that they are too dated for today’s modern couple or do you think that couples need to take advice from their mother’s or grandmother’s old-fashion ways? I agree! The rules are not all bad but some are so out of touch that it would be hard for today’s woman to take seriously. In 1913, women didn’t have to have it all so it would have been easier to carry those rules without hesitation… I showed my husband the book and he found it amusing and laughed at most of the rules!